In developing countries, one of the many challenges faced by researchers is increased pressure to conduct research, but inadequate resources provided to do their work. Perhaps nowhere is the inadequacy of research resources more apparent than in the area of access to scholarly research. In this chapter, using survey data, usage statistics, and interviews of researchers, librarians, and research administrators, we describe the information seeking behavior of scholars in Mongolia and how this behavior intersects with the resources made available by research administrators and librarians. 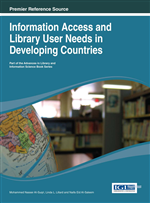 Much of the existing research on scholarly communication in developing countries has focused on whether access to scholars should be donated or provided free of charge without restriction. In Mongolia, the issue isn’t so much whether access to scholarly communication should be donated or not, but rather whether the scholarly communication system meets researcher needs, is adapted to constraints within the country, and reduces communication dependency. What we find is that the scholarly communication system in Mongolia fails to completely meet researcher needs and makes the country dependent on the scholarly communication products provided by outsiders. Mongolia’s economy and culture are both undergoing a significant transition from a socialist planned economy to one more responsive to market forces. This transition, in turn, has had the consequence of increasing higher education enrollment and encouraging researchers to do more research and publish their findings. Beyond the changes specific to Mongolia, the way in which research results are published has also been changing in recent decades with researchers around the world being encouraged to communicate via an electronic medium. In this section, we outline the connections between the changes in the economy, in the research infrastructure, and in the scholarly communication process. With respect to the economy, Mongolia began its transition from a centrally planned to a market based economy in 1990. The early 1990s represented a particularly turbulent time in the transition with triple digit inflation, high unemployment, and shortages in goods and services as economic output fell by a third. Although the prospects for economic growth would not seem immediately apparent for a developing country that was for so long under the tutelage of the Soviet Union, the Mongolian economy more recently has been one of the fastest growing in the world. And it is the fact that much of the economic growth in the country comes from natural resource extraction that has raised concerns. Given the eventuality of the natural resource being exhausted and economic growth falling, economic authorities in Mongolia have focused on creating the conditions for sustainable growth through the establishment of a knowledge-based economy. Such an economy requires an expanded and well-funded university system and research infrastructure.